By recruiting family, friends and co-workers to join your team and support your personal efforts for the Little Red Heart Run, you are giving hope to thousands of people whose only chance at life is a transplant. 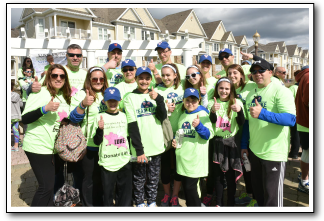 This web page is designed to provide you with resources to make team recruitment, promotion and fundraising fun and easy, so that together we can reach this year’s fundraising goal of $50,000! You are our stars, team captains . . . we appreciate all that you do! Event starts at 9:30 a.m. Parking available off S. Lincoln & Riversport Dr.